Today only, as a part of its Gold Box Deals of the Day, Solo Stove via Amazon offers the Neolite Double Camping Hammock in 19 colors for $47.99 Prime shipped. This hammock has a list price of $90 but typically goes for around $60. Today’s deal is the lowest that Amazon has ever sold it for. The Neolite Double Hammock is ideal for soaking in some sun while camping, hiking or hanging out on the beach. Gear up for the spring with this two-person nylon option that is just over 10-feet long and is supported by solid steel carabiners. It can hold up to 400 pounds at a time and ships with a drawstring storage bag. 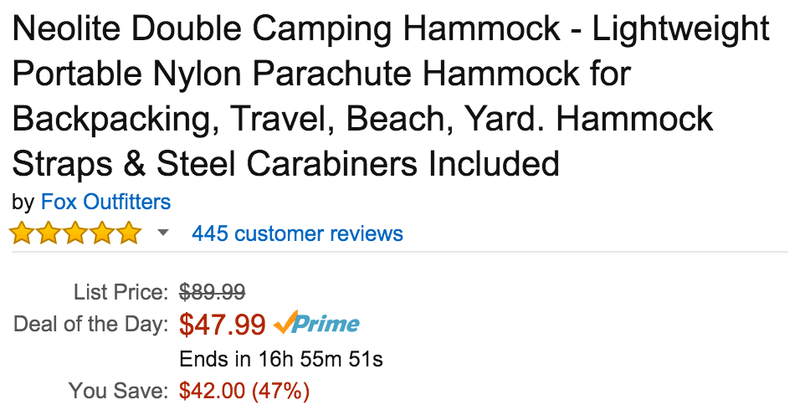 Perhaps most impressive is the 4.8/5 star rating this hammock has collected from 445 Amazon customers. Holding up to 400 lbs., the Neolite Double Hammock allows room for one or two people and is made with high strength breathable nylon that will always dry quickly. It also includes tree friendly straps, ropes and carabiners for easy setup.